The BRUIN Series Storage Container/Trash Receptacle is easily strong enough to keep out smaller critters like raccoons, squirrels, rats and smaller Black Bears. To meet the requirements of being a Certified Bear Resistant bin, you will need to install the included Bear Guard brackets, which prevent bears from being able to grab the lids and potentially bend them. With these brackets the BRUIN is able to stand up to all Black and mid-sized (up to 600 lbs.) Grizzly Bears. The Enviro World 55 gal. 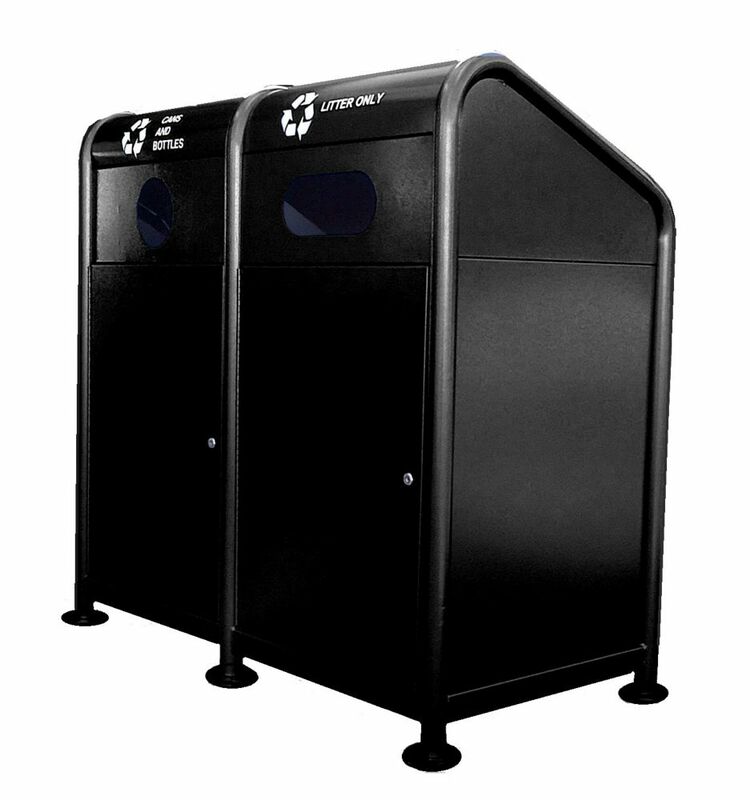 Recycling Bins Black combine toughness and economy in a large capacity unit.. Sleek flat back square design fits naturally in any location, High quality injection molded easy to keep clean and look new year after year. The Enviro World 55 gal Bin is focused, for two reasons: it allows the unit to hold a large capacity in a small footprint, and the units can be stacked together for transport or storage. The 2013 complete pet waste system is perfect for any area with high traffic pet ownership. The system is designed for outdoor use in and around public parks, condominiums, residential paths, schools/universities, and common courtyard areas. Includes one pet waste bag dispenser, one pet waste disposal, one case of pet waste bags (10 boxes of 200 bags), and one pedestal mounting post. The dispenser is made of 18 gauge steel and finished in grey powder coated rust proof paint. It is lockable and has a capacity of two pet waste bag boxes (total capacity of 400 bags). The disposal comes with steel, rust proof mounting bracket and 100% recycled rotationally moulded polyethylene disposal bin. This bin has a 18.75 litre (5.4 US gal) capacity and includes both drainage holes and keyed tumbler lock to prevent theft. The complete system includes a case of 10 boxes of pet waste bags. Finally, the package includes one mounting pedestal. The dispenser comes with a label reading "Pet Waste Station". Wall mounted recycling container fixed design eliminates the possibility of blocking exits in the event of an emergency. Also allows for easier ground cleaning by maintenance staff. Can be used in commercial or residential settings. Flexible modular component design to accommodate specific separation requirements. Ergonomic front loading door reduces risk of back injury. Inclined top discourages use as a table or chair. All exterior components are fabricated metal for maximum fire protection. Two leak proof roto moulded polyethylene liners included. Full length piano hinge on door. Magnetic latch on door. Assists commercial and institutional organizations with source separation programs or recycle programs. Materials: 18 gauge steel. Enjoy ultimate convenience with this 2-in-1 Trash Can and Recycle bin combo. Two removable, independent inner buckets hold up to 8 gallons of trash or recyclables each. It features a super soft, silent lid close. The fingerprint-proof stainless steel finish is sleek and modern. Convenient carry handle on the back. 68 Gal. Steel Recycling Station in Black The BRUIN Series Storage Container/Trash Receptacle is easily strong enough to keep out smaller critters like raccoons, squirrels, rats and smaller Black Bears. To meet the requirements of being a Certified Bear Resistant bin, you will need to install the included Bear Guard brackets, which prevent bears from being able to grab the lids and potentially bend them. With these brackets the BRUIN is able to stand up to all Black and mid-sized (up to 600 lbs.) Grizzly Bears.